Product cost –includes costs incurred– for manufacturing or for purchasing goods. 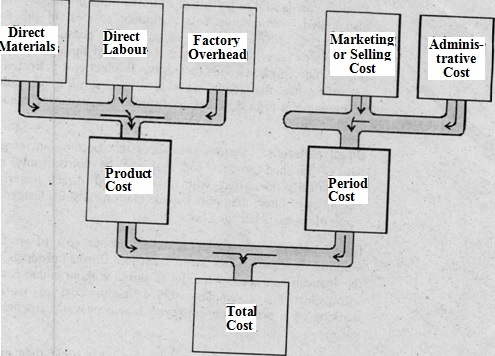 In case of manufacturing business product cost consists of direct materials, direct labour and factory overhead. In case of trading business, product cost involves purchase price plus transportation in plus other costs associated with receiving. Direct Materials. Various substances that become an integral part of finished product and that can be conveniently and economically identified with it are called direct materials. Examples of direct materials include cloth for a shirt, leather for a pair of shoes, paper for a book etc. Direct Labour. Direct labour is the labour cost of workers working on materials to convert them into finished products and the cost can be traced with units of output without undue cost or inconvenience. Examples include labour cost of workers working on a production conveyer, labour cost of carpenter or tailor. Factory Overhead. All manufacturing costs other than direct materials and direct labour are collectively termed as factory overhead. These costs are also described by such names as manufacturing overhead, indirect manufacturing expenses, factory burden. This classification includes such costs as indirect materials, indirect labour, power, light, depreciation, repairs, cleaning and maintenance etc. The term indirect materials is used for those items of materials which may become part of finished product but may be traceable into the product only at unreasonably high cost or inconvenience. For example, welding material used in the production of a bicycle or the cost of thread used for binding this book. As direct relationship exists between finished product and direct materials and direct labour, these two costs are jointly called prime cost. Direct labour and factory overhead costs are incurred to convert raw materials into finished products, therefore, these two costs are jointly called as conversion cost.